The Komondor is a rare dog breed originating from Germany. Known for their protective, watchful personality, this Hungarian herd dog is massive and has a thick, almost deadlock style coat that sets it apart from many dogs. This coat was especially advantageous for guarding sheep, as it blended in with them. This dog breed will spend most of its time sitting around and watching people pass. This is only natural given the Komondor’s protective instincts as a guard dog, however, being under constant surveillance can become a bit uncomfortable. If you're planning on getting the Komondor, you should expect some staring. Komondors or Hungarian Sheepdogs as they are also known are considered to be vocal dogs. With a bark almost as big as their size, these sheepdogs can get into trouble with all the noise they make. The volume might be manageable, but the frequency of their barking makes it a bit of a nuisance. Bred to alert for anything and everything, Hungarian Sheepdogs should not live in places of high population density as it just gives them more things to bark at. These dogs can guard more than just sheep. Mop Dogs, another nickname, infamously have a tendency to be overly defensive of their owners, making them land on the “does not play well with others” list, as they can become aggressive when it comes to strangers, human and canine alike. Some dogs are better at making friends than others. Unfortunately, the Mop dog is not one of them. These dogs have been found to be challenging when it comes to coexisting with other animals, especially with other dogs. The Hungarian Sheepdog is not an ideal dog when it comes to sharing the house with other canines. 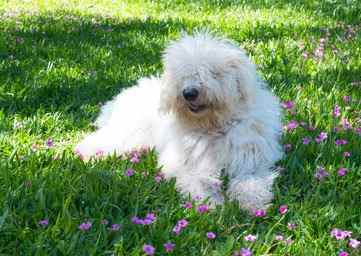 The Hungarian Sheepdog is an intelligent dog breed. However, they are known to be stubborn, making training difficult. The owner of a Mop Dog must be an authoritative figure to it. Without an experienced owner, the dog may become inattentive, disobedient, and unwilling to learn in general. They only fully mature by the age of about three and often need to be taken to obedience classes. Being a working breed, these dogs will be happiest when it is doing its job. This mentality can be hard to satiate and makes having them as just a pet difficult. Hungarian Sheepdogs are also not too energetic, and can gain weight by just laying around. Giving them some sort of duty can keep them happy and more robust as well as preventing weight gain. As you may have realized, they are not particularly social. But, with the right training, they can be. Early socialization for these dogs can help them become more used to the presence of other canines. Many owners of this breed take them to classes to have them become more familiar with other dogs. Overall, the Mop dog is an affectionate dog breed. They make good family pets, although it is not best for them to be around small children, given their size. Once they are fully mature, they can become an calm, and loyal companion. 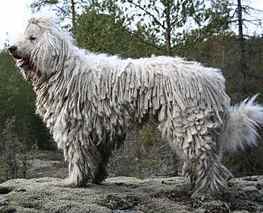 The Komondor was first documented in the early 1600s, but it most likely had been around long before that. Descending from Russian sheepdogs, it's suspected that they had been guarding Hungarian herds of various animals for centuries. They appear to have been brought into the country of Hungary by a group of people known as the Cumans. The Cumans were a Turkish-speaking group originating from China and brought these dogs with them as the fled from the vicious Mongols into Russia in the 1200s. It is from the name Cuman that the breed gets its name. It gained popularity as a herding dog because of its impressive guarding skills and gained special favor among sheep farmers. The breed's ropey, thick and white coat helps them blend in with sheep, as well as protecting them from attacks and the elements. It was in the 1930s that these dogs first began to make appearances outside of its native Hungary. First being registered in Germany, this herding dog gained popularity in Europe and later the United States. Eventually, many farmers switched to growing more than livestock, yet many of them kept their dogs around as guard dogs regardless. This breed along with many other dog breeds, faced an uncertain future during the years of WWII. Breeders who favored the Komondor kept the breed alive throughout the turbulent years, yet barely. The breed remains a rare and somewhat unknown as the population is not very high. After surviving the Second World War, the breed began to grow its numbers once more in the United States. By the 1960s, they reached its previous population high once more. This can be attributed to the increase of Hungarian immigrants and Hungarian figures in pop culture. Later in the 1970s they became popular in France. In modern days, the Komondor has been repurposed for the-the most part. Its herd guarding skills dropped in demand, which led to its current status as being more of a companion dog. However, the breed still have many occupations around the world that go beyond herding. Activities such as sled pulling, water rescues and property guarding are how most Hungarian Sheepdogs today spend their time. The Komondor was officially recognized by the AKC (American Kennel Club) in 1937. Today, they ranks 162 in popularity in the United States according to the AKC. Komondors are only known to have white coats. This is also the only coat color recognized by the AKC for this breed. There are other breeds similar in size, personality, and appearance to the Komondor with different coat colors as well, so if white doesn't suit you, there are other options. Pulis also have the same hair texture but are not limited to the white coloration. Members of this breed are known to be difficult to train. Given their intelligence, they can be a bit stubborn. Komondors need a strong disciplinarian figure as an owner, they need to know who is in charge. They were bred to act and live on their own, and will choose to do so should they have a pushover of an owner. This is not an ideal breed for beginners when it comes to training. Even the most hardened dog owners will have difficult commanding their respect and attention. Most owners of this breed will take them to multiple obedience classes, as it is very challenging to train them otherwise. Despite the somewhat difficult training process, once they has been trained it is set. Mature breed members that have been raised properly will treat their owners with the utmost respect and protection, as well as affection. Hungarian Sheepdogs notoriously have difficulty interacting with other canines, and must be trained otherwise. By taking them to classes as well as letting them experience a variety of things, a Komondor will become more familiar with its environment, and thus less hostile. When it comes to security, one can't go wrong with getting a Komondor. Bred to be herd guards, these dogs have been protecting for centuries and it’s arguably what they do best. Owners of this breed will always feel the wary eyes of their dog. This hound will also often stalk around the house in the night, patrolling for anything out of the ordinary. Given their immense size and strength, the Mop Dog is a force to be reckoned with. This dog will often knock down intruders and keep them there until their owner comes to handle the situation. While this is useful when it comes to protection, one must make sure that their dog has the ability to distinguish a friend from a foe, or else they may perceive all strangers as threats. Alongside their size comes the volume of their barks. These dogs are especially loud so that they might alert their owners to the presence of an intruder. Again, early exposure to different things can help keep them familiar with there surroundings, which can keep them from barking up a storm. If you or a neighbor are sensitive to loud noises, to preserve your sanity, do not get a Komondor. Komondors are distinguishable by their thick, ropey coats. While their hair coat may be useful, it is difficult to keep clean and maintain the natural white color. They require vigilant and frequent grooming to keep them clean from dirt, bacteria, and parasites. To maintain a decent coat, they must regularly be bathed, but their top coat should not be brushed. The topcoat is supposed to have a thick ropey quality, and each rope of hair must be separated to prevent matting as well. Regular ear cleaning is vital as well for grooming. This breed has downward hanging ears, making it more prone to infection. By keeping the dog’s ears clean you can substantially reduce the risk of infection. It is important to brush their teeth 2-3 times a week. Regular brushing can reduce plaque, smell, and prevent tartar build up. Trimming hair around the mouth of the dog can help prevent smell as well as preventing food from staining its coat. This breed, as with all dog breeds, is prone to certain medical problems more than other breeds. It is important to take these possible health issues into consideration as well as providing the dog with decent healthcare. These issues have been reported in the breed but any one dog is not inevitably condemned to them. Not all dogs will be affected by these possible health issues, yet it is important to be familiar with them none the less. Genetic diseases can be avoided by having a good breeder that knows the lineage of its dogs and their possible health concerns. This may be difficult, as there are not many breeders since it is not a very popular dog. Finding reliable dog breeders is important in buying any dog breed. A Komondor is featured on the album cover of Odelay, an album by Beck. Komondors are also a popular symbol of Hungarian culture.